Fishing is more fun in groups, dare we call it party boat fishing? When organizing a large fishing trip, too many times the fishing aspect is pushed to the back burner. At RedFin Charters, we think the fishing should be good to maximize everyone’s experience. Gather up your closest friends, their friends, and maybe the office too, nothing is better than a Charleston, SC fishing tournament. 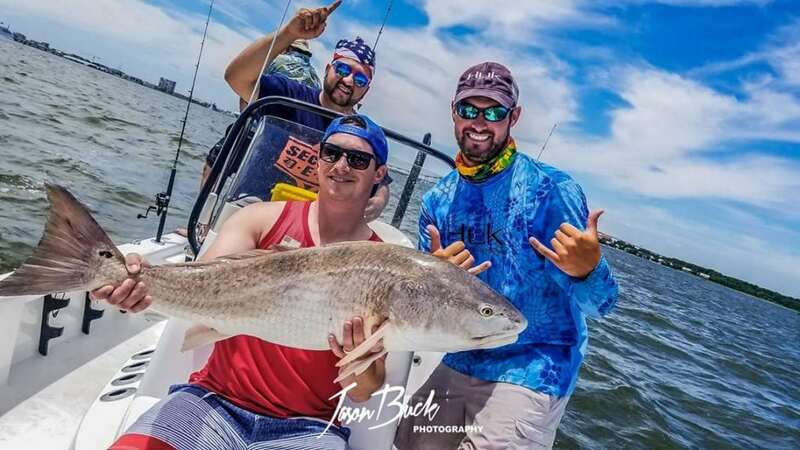 Inshore fishing provides a top-notch atmosphere for group fishing events. Protected from the strongest winds and waves of the open sea, fishing here is almost like being on a lake. Don’t start thinking the shallow waters mean less fish. With ample estuaries and multitudes of creeks, the ecosystem is healthy and well stocked. Fish grow large and plentiful in our waters, meaning anyone can catch them. The fishing tackle is user-friendly. If your group features many first-time fishermen, they will get the hang of fishing quickly. We use spinning reels, on 6-7 foot poles, allowing for casting by novices and children alike. Even the fish themselves are fun to catch. Easily the most popular fish in the waters, they average around 20 inches in length. Hard fighters with an aggressive bite, even first-timers will know when a fish is on the line. Fun to catch, these fish resemble their freshwater relatives. Sea Trout fishing is picked up quickly and finding a school can prove to be the life of any party boat fishing outing. The fishing is the most important part of a group fishing trip. This being said, we know not everyone is a die-hard fisherman. For these people, being on the water should be just as enjoyable without a fishing rod in hand. Our boats are fast, new, and well stocked. Charleston, SC gets hot and humid in the summers. We pack plenty of ice which allows for any number of beverages to be kept ice cold throughout the day. It’s more than just a fishing trip – at least for some. In order to maximize time on the water, all of our party boat fishing takes place in multiple vessels. Not only do more people get to fish but it builds friendly competition between boats. From team building events to bachelor parties, a fishing tournament brings everyone together. With up to 20 boats available for large groups, your group fishing charter is highly customizable. You pick a marina that works for you, and the boats will be ready. With available times of 4, 6, or 8 hours, spend as much time on the water as you like. No matter the size of your group, RedFin Charters has equipment and know-how to create a successful fishing trip. We take care of all the logistics, all you need to do is bring the party. Contact us to find out more about group charter packages.